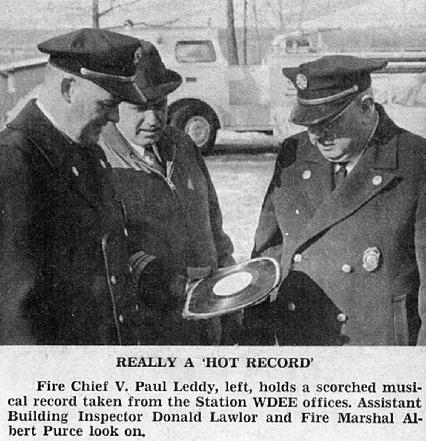 The Beatles' "I Feel Fine" was No. 1 on the charts, but the folks at WDEE weren't feeling it. The 1960s was the golden age of Top-40 radio. The target audience of many AM radio stations all over the U.S. were the early baby boomers who were in high school. FM radio, still the mainstay of classical and so-called "elevator music," would not become the predominant medium of rock music until the 1970s. Every Top-40 radio station had its fair share of "Ron Radio" DJs, who talked a mile a minute and who could do a perfectly timed "talk up" over the musical intro of any song, finishing their spiels the very instant Elvis, Aretha, or the Beach Boys started singing. If you're over 60, you probably remember local DJs like Bill Beamish, Ed Flynn, Bob Terry, Tracy and, of course, T.J. Martin, along with the many others who spun those immortal recordings of our youth that we now can download to our iPhones. In 1965, most Hamden kids were listening to at least one of three local Top-40 radio stations: WPOP (1410 KHz) in Hartford, WAVZ (1300 KHz) in New Haven, and WDEE (1220 KHz), located in a converted ranch house on Denslow Hill Road right here in Hamden. 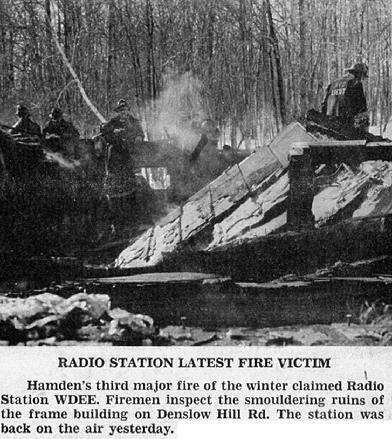 Unlike WPOP and WAVZ, Hamden's radio station WDEE was a "daytimer," with a relatively low power output and an FCC license that restricted its airtime to daylight hours only. This restriction meant that WDEE's broadcasting hours varied with the length of the day. In summer, you could listen until almost 9. In winter, they were off the air by dinnertime, a possible factor in the destruction of WDEE. CLICK on any of the images below to enlarge for reading. 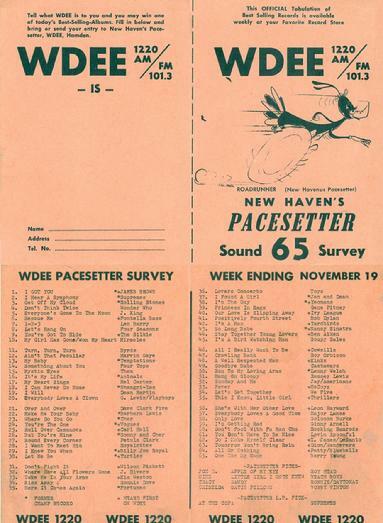 CLICK to see what kids were listening to on WDEE, and elsewhere, in 1965. 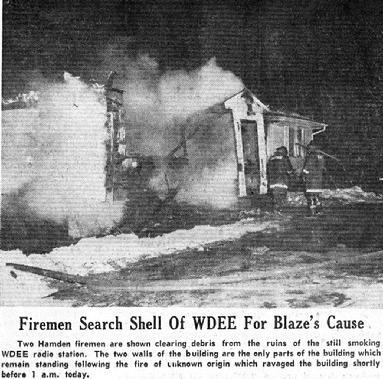 WDEE was back on the air within days of the fire, with temporary studios and offices located in a building in the northeastern corner of 60 Connolly Parkway. Radio station WELI, a local competitor, even donated records of its own to help WDEE get back on its feet. A new WDEE studio was built on the site of the old one, only to suffer a similar fate in the late 1970s (more on that fire at a later date). WDEE's FM station (101.3 MHz) was later sold to Kopps-Monahan Communications and became WKCI. WKCI continued to play easy listening music until 1979, when it switched formats with its new sister AM station, WAVZ, and became a rock station. In the years following the fire at WDEE, the radio station changed call letters several times as ownership changed. In the late 1960s it became WCDQ, then WOMN, then WSCR. Finally, in the 1990s, the radio station was purchased by Quinnipiac University. Radio station WQUN (1220 KHz) is now located on Whitney Avenue, just north of Station 5 in Mount Carmel.